The Papal Audience is usually scheduled to start at 10:00am. However, you will find that most people will arrive early (up to 3 hours before) to get a good seat. Security opens generally at 8:00am. If you are unable to arrive early or get a ticket in advance, again, as the the audience is usually held in St. Peter's Square during the Summer season it is still possible to access the Square and participate as there is plenty of standing room at the back of the Square. Pope Fracis has made it very clear that EVERYONE is welcome to attend (with or without a ticket) so please do not be discouraged from attending if you do not have a ticket. 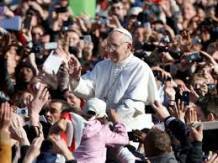 Although the Pope holds the Audiences regularly on Wednesdays there are times when he may be on a Pastoral Visit around Italy or overseas or he may be enjoying the Italian holiday period in his summer residence of Castel Gandolfo during the month of August, in which case the Audiences will either not be going ahead or will be held at Castel Gandolfo. As the Vatican Offices are normally closed in August for the Italian Holiday period, tickets are not necessary for the August Audiences. The Vatican do list the dates of Audiences and events on their website and they normally update it periodically, usually 3 months ahead of any scheduled dates. Always Tickes for Papal Audience are entirely free. The other opportunity to see the Pope is on a sunday at 12 noon when he is in Rome. He will appear from the window of is apartment where he gives a short speech followed by the Angelus and ending with a blessing. He may also greet the crowds in various languages and the whole event usually lasts around15-20mins. He will impart the Apostolic Blessing at the end of the prayer. You DO NOT need tickets for the Sunday Angelus.